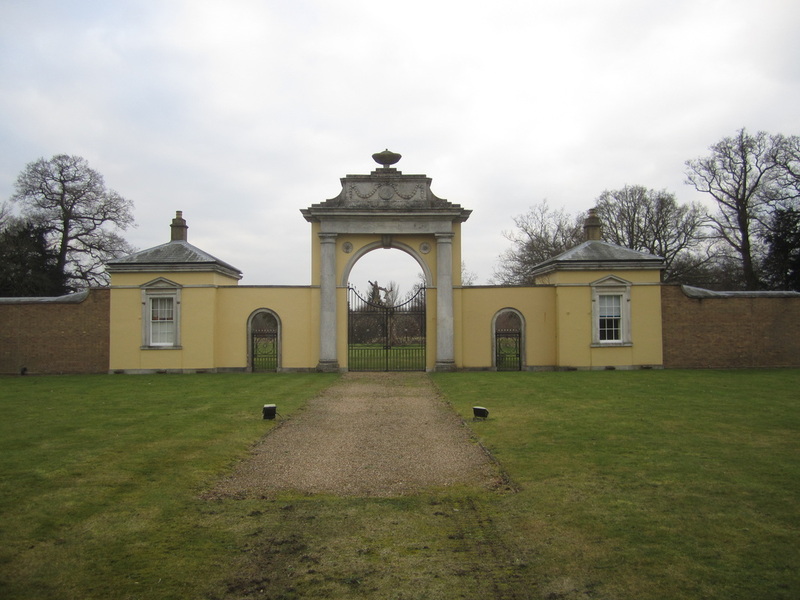 Welcome to the official website for The Hertsmere Way Long Distance Path (LDP). The Hertsmere Way has been created by Ian Hardy, MVO, a Potters Bar resident and an active member of the local Ramblers Area (Hertfordshire and North Middlesex) and Group (North London and South Herts) - see the website links on the Info page. 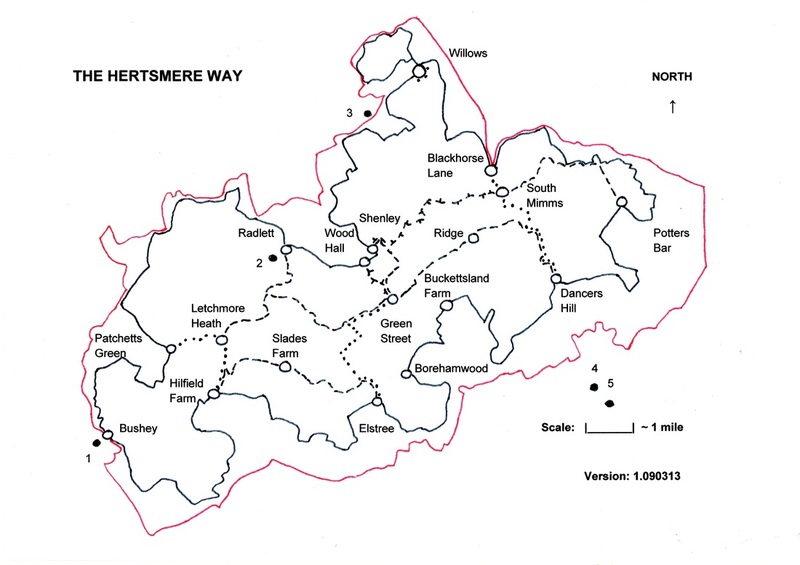 The creation of The Hertsmere Way was announced in the January 2013 Newsletter of the Ramblers North London and South Herts Group, and an item about the Way was included in the Spring 2013 issue of Hertsmere Borough Council's magazine, distributed free to all households in the Borough. The Way is also included in the Long Distance Walkers Association's (LDWA) online database of Long Distance Paths (note that the "Willows" photo included there is just off the Way) , and was featured in the April 2013 issue of its magazine Strider. LAURIE CAHILL-SMITH has now completed the Way, becoming the second known completer (apart from me!) after Leonard Will - CONGRATULATIONS TO LAURIE! Below is a lovely photo taken on the Willows Fisheries lakes, north-east of London Colney. Along the way, Laurie has recorded and forwarded a wealth of updating information about the routes, with accompanying photos. Many thanks to Laurie for all these efforts. All I need to do now is find the time to update The Guide, and produce some maps - ho hum! ​With the successful conclusion of 8 years' hard work sorting out and expanding the public rights of way in and around the Willows Farm area between London Colney and Colney Heath, the Willows leg of The Way will soon be able to benefit from an amended, expanded and more scenic route! MANY CONGRATULATIONS to LEONARD WILL, from North Enfield, a Rambler. Leonard completed the last leg of The Hertsmere Way, from Potters Bar to South Mimms, on 11th August. He thus becomes the first person to report completing The Way, after the compiler. In fact this completes a Hertfordshire double for Leonard, since he's already done The Hertfordshire Way! The Hertsmere Way has been featured in the June 2013 Issue of Stile Magazine, the Journal of the Ramblers Hertfordshire and North Middlesex Area (on pages 22-23). I have discovered (embarrassingly! ), an error in the Geographical Map of the Way, one alternative section is missing! - Buckettsland Farm to/from Green Street - my apologies! 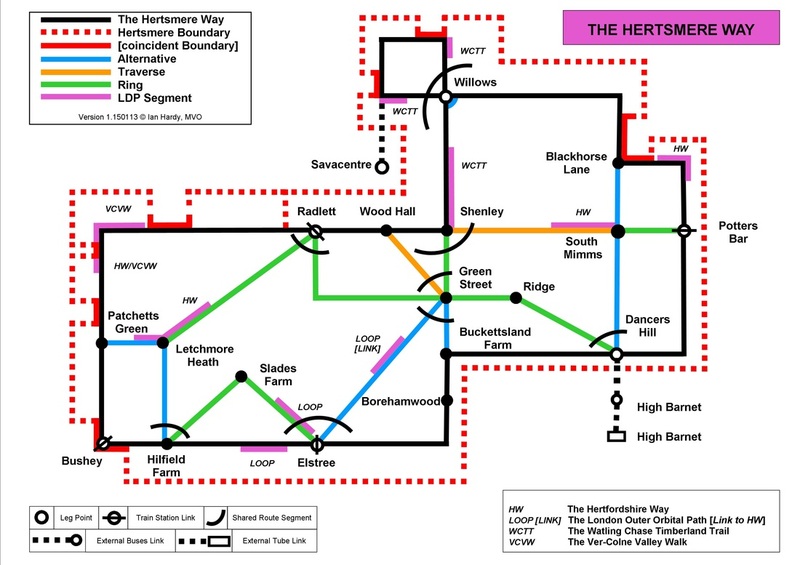 If anyone would like a copy of The Guide to The Hertsmere Way, which includes the outline geographical scale map and schematic plan shown below, a series of suggested loop walks, and detailed directions for all the Way routes; please e-mail, or complete and submit the site e-mail form. Details of both are on the Contact page. The Hertsmere Way is about 50 miles long, around the inside of the boundary of Hertsmere Borough (in Hertfordshire, in the UK) using public rights of way wherever possible, and divided into several walking legs from locations with public transport links. There is also a network of support routes to provide a wide variety of loop, figure of eight and linear walking opportunities of many different lengths. The schematic plan below presents the Way in "London tube map" style (so is not to scale). A scaled geographical outline map is shown below the plan. The Way's logo is a portcullis, shown below. A similar portcullis is incorporated in Hertsmere Borough's Coat of Arms. 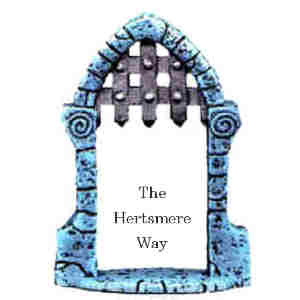 Hertsmere's Coat of Arms features harts (like Hertfordshire's) and a portcullis, the portcullis representing the London boundary, "mere" being an old word for boundary (see the Photos page). So it is quite appropriate for The Hertsmere Way, since the main Way echoes the Hertsmere boundary. A portcullis also translates well into a simple line drawing for any future waymarking of the Way. Site visitors can offer photos, news items or comments about the Way for inclusion on the site (all credited to the visitor). Lists of walkers who have reported completion of the main Way or of all the routes are also included. Please see the Info page for statements on walker conduct, safety, risk and liability, and on site privacy and accessibility.